Aloe vera is a nutritional storehouse. It also contains salicylate and prostaglandins. Aloe nutritionally benefits the intestinal system. Freeze-dried aloe vera provides the same benefits as liquid Aloe Vera Juice but in capsulated form. Freeze-drying removes water content while maintaining the full botanical value of Aloe Vera. 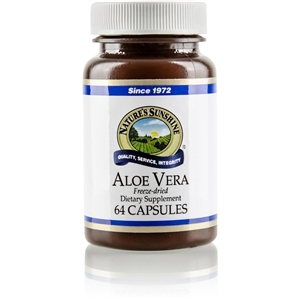 Each capsule is equivalent to 1 fluid ounce of 100% Aloe Vera juice. Take 1 or 2 capsules with a meal three times daily.